In this tutorial series, we are creating a very simple game for the iPhone using the lowest level APIs on iOS – OpenGL ES 2.0 and GLKit. In the first part of the series, we created a basic OpenGL 2.0 and GLKit project, created a class for Sprites, rendered them to the scene, and made them move. In this second and final part of the series, we’ll let the ninja shoot stars, kill monsters, and win the game! Keep reading to become a code ninja and finish this game! Convert the touch to OpenGL coordinates. Figure out the direction (vector) of the touch, with respect to the ninja. Normalize the vector so that it is a length of 1. 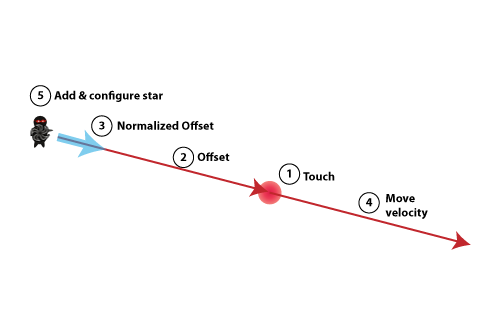 This makes it easy to make a vector pointing in the same direction as the offset vector, but with a particular length, which we’ll need in the next step. Multiply the normalized offset by the velocity we want the ninja star to move. We now have a vector pointing in the same direction as the diference between the touch and the ninja, but a length based on where we want the ninja star to be after 1 second. 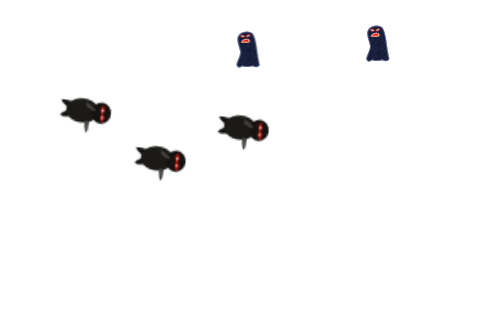 Create a ninja star sprite and set its velocity based on the above. The numbered steps here correspond to the same steps described above – flip back if you’re confused. Compile and run, and now you should be able to tap to shoot ninja stars! So now we have shurikens flying everywhere – but what our ninja really wants to do is to lay some smack down. So let’s add in some code to detect when our projectiles intersect our targets. 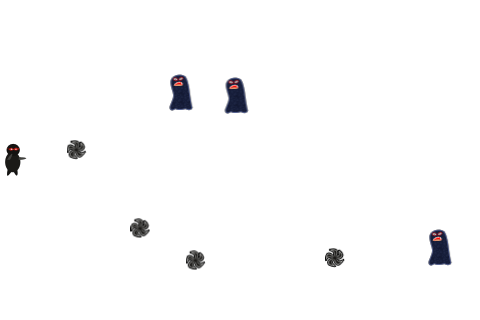 First, we need to add a new method to SGGSprite in order to return the bounding box for the sprite on the screen. We need this so we can check if two sprites collide. Now we have an array of the targets and projectiles currently in the scene. We also added a variable to keep track of the number of targets destroyed (we’ll need this later). The above should be pretty clear. We just iterate through our projectiles and targets, creating rectangles corresponding to their bounding boxes, and use CGRectIntersectsRect to check for intersections. If any are found, we remove them from the scene and from the arrays. Note that we have to add the objects to a “toDelete” array because you can’t remove an object from an array while you are iterating through it. Again, there are more optimal ways to implement this kind of thing, but I am going for the simple approach. Compile and run, and now when your projectiles intersect targets they should disappear! You should already have some cool background music I made (background-music-aac.caf) and my awesome pew-pew sound effect (pew-pew.wav) in your project, from the resources for this tutorial that you added to the project in part 1. We’re going to cheat a little bit in this part of the tutorial and use a premade sound engine, CocosDenshion. CocosDenshion is actually the sound engine that comes with Cocos2D, but you can use it in any project just by including the files. We could play the music and effects ourselves by using the easy-to-use AVAudioPlayer, but you’ll find that performance is not up-to-snuff for playing rapid sound effects like we want for this game. Alternatively you could use OpenAL yourself, but the focus of this tutorial is not on OpenAL so we are going to go the easy route. So go ahead and add the CocosDenshion files to your project. You can copy them from your Cocos2D installation, any Cocos2D project, or just be lazy and download a CocosDenshion zip I made. If you try to compile your project you’ll get a ton of errors, because CocosDenshion is not ARC compatible. Luckily fixing this is easy. Select your project in the Project Navigator, select the SimpleGLKitGame target, and go to the Build Phases tab. Double click CDAudioManager.m, and a popup will appear. Enter -fno-objc-arc into the box – this makes them compile without ARC support. Compile and run, and enjoy the groovy tunes! The only step remaining in our game is to handle the win/lose condition. When we did this with Cocos2D, we would simply switch to a different game scene that would display some text showing if the user won or lost, and then restart the game. We could cheat and add logic into the SGGViewController.m to clear out all the nodes, display a win/lose, and restart the game, but it would be better to refactor our code a bit into using a node hierarchy. Right now the SGGViewController.m contains a list of sprites to display. But why not make it so that it just has a root “node” to display, and that “node” can have children, and so on? This way we can have a node that is a “scene” that contains the action scene, and another for the “game over” scene. This is also handy for situations where you want to have other parent/child relationships, so that moving the parent node moves the child node, and so on. There’s a good bit of refactoring to do, so if you want to call it a day at this point, here’s the finished project without refactoring. Otherwise, read on to learn about creating node hierarchies and scenes! The first thing we’re going to do is create a class for a node, and move some of the code that’s currently in the SGGViewController and the SGGSprite to this new class. Create a new file with the iOS\Cocoa Touch\Objective-C class template. Enter SGGNode for the Class, NSObject for the Subclass, click Next, and click Create. Here we bring in several properties from SGGSprite (position, contentSize, and moveVelocity), as well as the children property from SGGViewController. 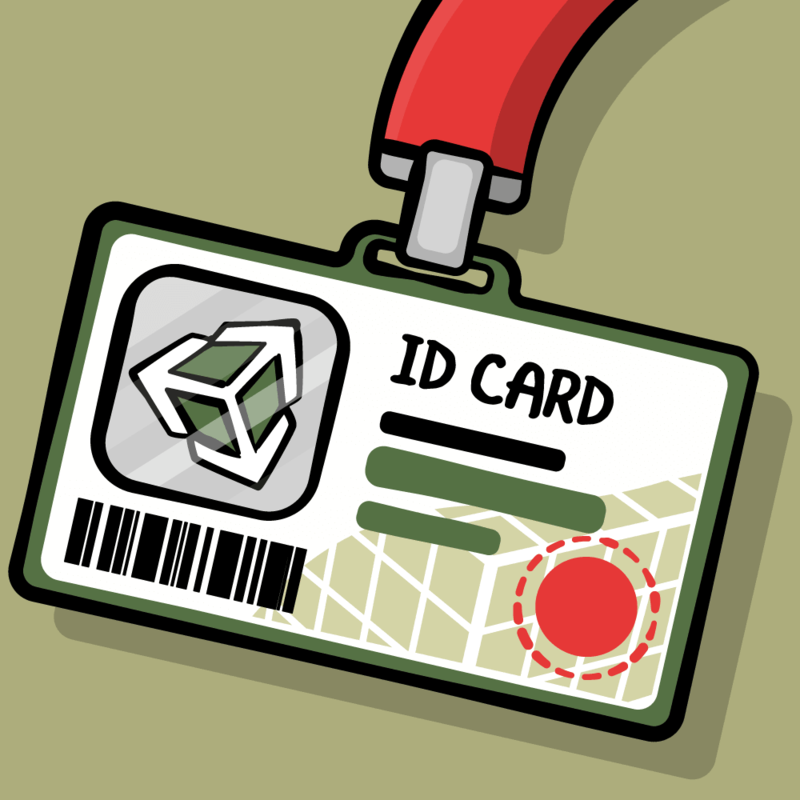 We also bring in some methods from SGGSprite (render, update, modelMatrix, boundingBox). Note that render has been modified to take a model view matrix as parameter, and modelMatrix has a flag – more on this later. Render method. The render method takes a paremter of the current transform so far. For example, if its parent has moved 100 points to the right, this will be a matrix representing a translation of 100 points to the right. It then updates the matrix with its own transform, and calls render on all its children. Update method. The main difference here is that it calls update on all of its children. modelMatrix method. This takes a parameter to see if it’s rendering itself. If it is, we use the “anchor point” to shift the sprite to the lower left to render the center of the texture at the point. Otherwise, we don’t want it to affect the matrix, so we don’t do anything with the anchor point. Note that Cocos2D does not seem to do things this way (I don’t understand why not, can someone explain)? Not much has changed here except we removed a lot of code. Compile and run, and your project should work as normal. Well, check out something we can do now that we couldn’t have done before. Let’s say we want to give this ninja a “posse” to follow him around the map. Previously we would have had to add 3 sprites, and manually set them to move all at the same rate. 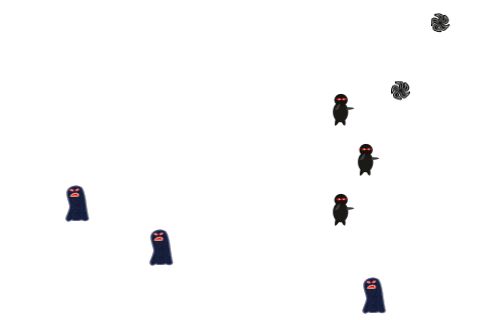 Now, we can add the posse as children to the main ninja, and when we move the main ninja his posse will follow! Compile and run, and now we have a ninja posse! Right now you can set the position of a node, but there are two other attributes on a node you commonly want to set: rotation and scale. 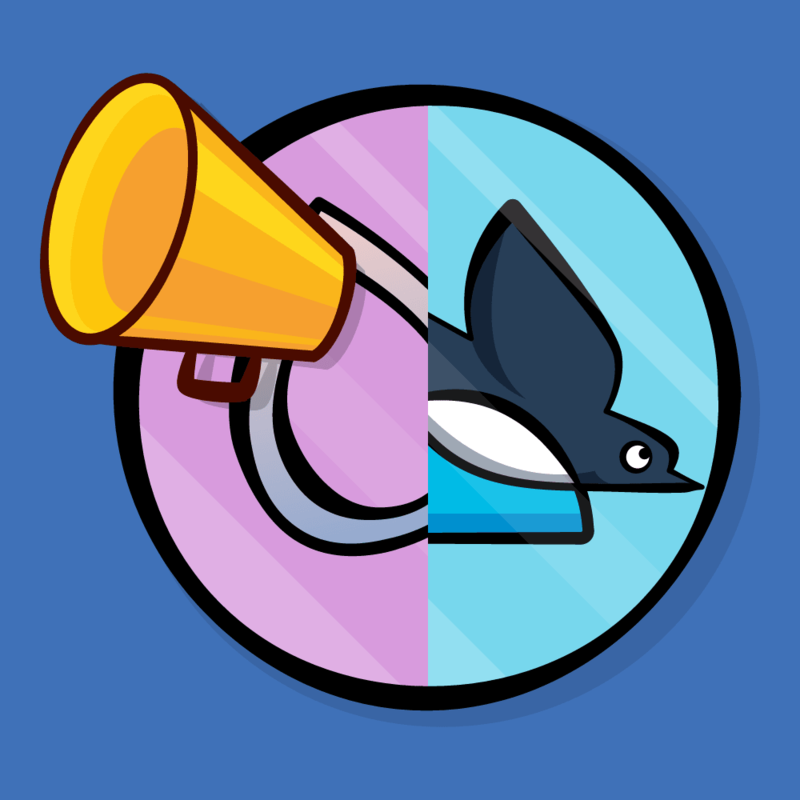 We won’t actually be using either of these in our game, but I wanted to show you guys how to do this because most likely you will need this in your games. Here we add a property for the rotation (in degrees) and the scale (1.0 = normal size). We also add a rotationVelocity and scaleVelocity for a easy way to get these values to change over time. The key part here is in the update method – we use the GLKMath methods to update our matrix based on the rotation and scale values. Now you have a rotating and scaling posse! Also, there’s a problem we have to fix. The bounding box method currently doesn’t take into effect the scale or the rotation of an item. This will mess up our collision detection if we were to scale a monster to be 3x the size, for example. Compile and run, and shoot at a monster but aim for the very bottom or very top. You’ll notice that it sometimes doesn’t register the collision, because it’s using the monster’s original size for the bounding box. Here we start with the non-translated rectangle for the node, and then get the model view matrix. We then need to convert our 4×4 matrix into a CGAffineTransform. Don’t worry if you don’t understand what line 3 does, just know that it converts a 4×4 matrix to a CGAffineTransform. We then use a handy built-in method to apply a CGAffineTransform to a rectangle, and give us the closest matching bounding rectangle. Compile and run, and now you should be able to shoot the giant monsters just fine! When you’re done, comment out the line that sets them to the larger size as we won’t be needing that. Now that we have our node class in place, we can start moving the game logic that is in SGGViewController.m into a scene class. You could modify this to forward touches to children based on their bounding boxes, etc. but again to keep thing simple we’re just going to implement what we need here – which is the scene getting info about when there’s a touch. Next create a new file with the iOS\Cocoa Touch\Objective-C class template. Enter SGGActionScene for the Class, SGGNode for the Subclass, click Next, and click Create. Wow – a lotta code here, but it is literally ripped out from SGGViewController.m, so it’s all stuff we covered before. You can just copy/paste it in there. Ah, much cleaner, eh? Compile and run, and the game should work just as before – but nicely abstracted into a scene class. OK cool – now let’s create our Game Overs scene. Create a new file with the iOS\Cocoa Touch\Objective-C class template. Enter SGGGameOverScene for the Class, SGGNode for the Subclass, click Next, and click Create. 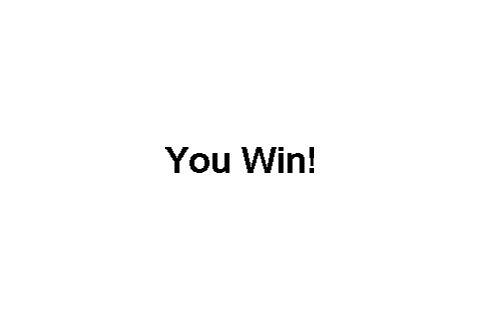 This simply places a premade image of “You Win” or “You Lose” in the middle of the screen on startup. After a certain amount of time elapses, it creates a new ActionScene and sets the currently running scene to this new scene. Here we add the game logic. If the player destroys more than 5 targets, they win, so create and display a game over scene. We also add some cleanup code to remove sprites that are outside the bounds of the scene to avoid endless memory allocations. 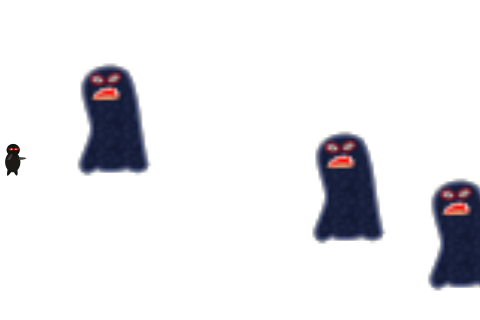 If a monster escapes the boundary of the screen, the game is over. Guess what – you’re done! Compile and run, and see if you can beat the game! Here is the finished and refactored project from this tutorial. Congratulations, you have made a complete game with OpenGL ES 2.0 and GLKit! You now have experience with creating a very simple game engine, and if you like you could use this as the basis for your own game engine. This tutorial should also have given you a better appreciation for Cocos2D and all that it does for you :] Since this engine is organized somewhat similarly to Cocos2D, you should also better understand how it works. If you have any questions or comments on OpenGL ES 2.0, GLKit, or this tutorial, please join the forum discussion below!